"2014 WTF World Taekwondo Grand Prix Series"
Awarding Ceremony for Men's -68kg Category Under Way on 3rd Day of 2014 WTF World Taekwondo Grand Prix Series 1 in Suzhou, China — Medal winners pose during the awarding ceremony for the men's -68kg category on the third and final day of the 2014 WTF World Taekwondo Grand Prix Series 1 at the Suzhou Sports Center in Suzhou, China on July 6, 2014. In the men's -68kg final contest, Korea's Dae-hoon Lee, the silver medalist at the 2012 London Olympic Games, crushed Russia's Vasilii Nikitin 19-6 to win the gold medal and a top-prize money of $5,000. In the category, Iran's Behnam Asbaghikhanghah and host China's Jiannan Huang shared the bronze medal. 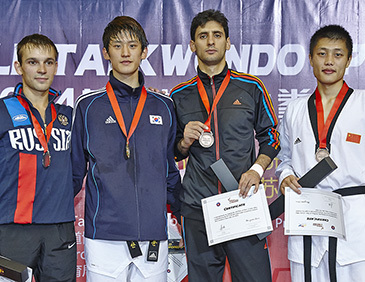 SUZHOU, China (July 6, 2014) — Spain and Korea clinched one gold medal each on the third and final day of the 2014 WTF World Taekwondo Grand Prix Series 1 in Suzhou, China on July 6, 2014. In the women's -57kg final match, Spain's Eva Calvo Gomez, the gold medal winner at the 2013 WTF World Taekwondo Grand Prix Final in Manchester, the United Kingdom, defeated Korea's So-hee Kim 2-0 to earn her country the gold medal. Calvo Gomez also received a top-prize money of $5,000. Calvo Gomez needed a fourth golden-point round to reach the final contest as she was tied at 4-4 at the end of the third round against Chinese Taipei's Li Cheng Tseng. Korea's Kim also required a fourth golden-point round after tying at 11-11 at the end of the third round against Japan's Mayu Hamada to advance to the final match. Kim made it to the round of four by beating Great Britain's Jade Jones, the gold medalist at the 2012 London Olympic Games and the silver medal winner at the 2013 Manchester Grand Prix Final, 8-3 in a quarterfinal match. In the men's -68kg final contest, Korea's Dae-hoon Lee, the silver medalist at the 2012 London Olympic Games, crushed Russia's Vasilii Nikitin 19-6 to win the gold medal and a top-prize money of $5,000. Lee advanced to the final match as he managed to brush aside a stiff challenge from his semifinal opponent, Iran's Behnam Asbaghikhanghah, to score the winning point in a fourth golden-point round. In the category, Iran's Asbaghikhanghah and host China's Jiannan Huang shared the bronze medal.